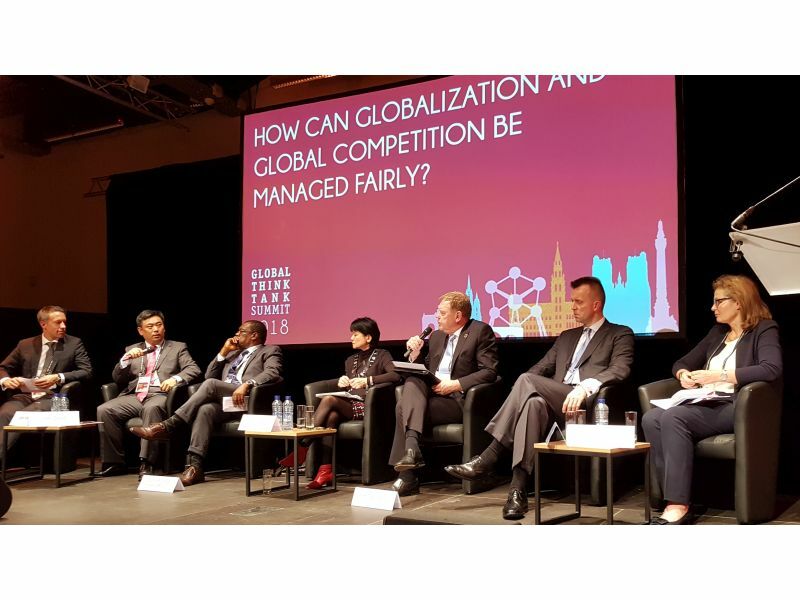 The Geopolitics of Climate Change were the focus of a panel at the 2018 Global Think Tank Summit (GTTS2018) in Brussels, hosted by European think tank Bruegel and the Think Tank and Civil Societies Program (TTCSP) of the University of Pennsylvania. Ecologic Institute prepared and hosted the panel, which covered the geopolitical dynamics of accelerating climate change as well as the geopolitical consequences of transformations such as in the energy and transport sectors. Climate change is accelerating, leading to global overheating and ocean acidification. If not effectively addressed, climate change will have profound effects on human (in-)security, water, and food security, stability or state failure, potentially aggravating pre-existing tensions and conflicts. The geopolitical dynamics of climate change and climate action – action designed and intended to transform energy, transport, food, and other large systems – are rapidly becoming a theme of concern to many think tanks. Most think tanks around the world work on war and peace, the control of territory, populations and resources, or economic activities and the appropriation and distribution of its benefits. Some think tanks focus on the protection of planet Earth and an equitable and sustainable society in all the dimensions captured by the UN Sustainable Development Goals (SDGs). The areas of interest and competence of many think tanks overlap on climate change and transformation policies, which makes it a great theme for the annual Global Think Tank Summit. R. Andreas Kraemer, Mercator Senior Fellow at Ecologic Institute, moderated the panel. Global overheating may have started as a "slow crisis", but we now see extreme events and catastrophes all over the world, making climate change undeniable and creating urgency. While the cost of inaction and adaptation to the inevitable impacts of climate change is increasing and becoming obvious, the cost of action on mitigation and transformation of large systems is coming down fast. The evidence for this is especially solid in the areas of energy and transport transformations. This state of affairs and the underlying trends are now better understood. The UN Security Council, G20, G7, and other international organisations and forums are dealing with aspects of the climate crisis, but not the whole. Climate change leads to uncertainty and insecurity for many people and desires to return to old certainties. Climate change drives involuntary migration, which contributes fuel to the insecurities driving right-wing populism. Fighting climate change is an important element of the defense of healthy, functioning democracies. Work on resource efficiency, and efficient and equitable allocation of scarce resources, including capital; explore and formulate options & strategies for technological leapfrogging for developing countries. Focus on allocation and issues of distributional equity within societies, across countries, and across generations. Learn to anticipate and assess the evolution of technologies that improve carbon intensity and carbon efficiency, and design policies for their promotion. Work to stop wasting resources and sharing key resources more fairly, including food, looking especially at the impact of meat production and consumption. Make the case for public policies intended to nudge individual choices, behaviour and consumption patterns toward climate-friendly alternatives. Develop strategies for courageous and transformative policies, policies that make a difference, while allowing policy-makers, especially policy innovators, to survive politically. Build bridges among countries, communities, disciplines, sectors and so on, in order to better understand and address the tensions and conflicts that arise from geopolitical dynamics unleashed by climate change and climate action. Work to improve understanding of the geopolitics of climate change, covering, for instance, negotiations, changes in commodity and resource trade flows, economic disruptions, shifts in dependencies and power relationships, anticipating the implications for petro- or carbo-states and their responses. Identify and expose incumbent industries and vested interests – such as coal, oil, fossil methane, diesel or combustion engines in general, or nuclear technology – that often resist and even sabotage policy action addressing the climate emergency. Frame policy options and strategies in positive narratives, focusing on the benefits of change and the many winners emerging from sustainability transitions.